I’ve always known that labeling recipes as Kid-Friendly is somewhat misleading; children, like adults, all have different tastes, so predicting what other children might like based on my own child’s taste (which seems to change as often as her clothes lately) is kind of presumptuous as well as silly. Still, the error of my ways was brought home to me in a big way this week during our annual extended-family vacation. Each year, the whole bunch of us, including my parents, my sister and brother-in-law, and their three kids, ages 9 to 14, rent a condo on the Gulf coast. This year’s destination was Pensacola Beach, where the condo had a huge kitchen that I would have loved to take home with me. That pronouncement was made to me after I’d spent an hour making two large enchilada casseroles, something I’d hoped would be enough like regular, non-vegetarian food to entice the kids to eat with us, but no way: they wound up eating big plates of cheese-covered tortilla chips instead…and we adults wound up eating enchilada casserole leftovers for the next three days. My point is, most of my recipes are kid-friendly only if the children you’re cooking for will actually eat vegetables and beans. 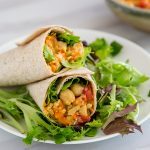 If you’re trying to transition your family to a plant-based diet and your kids absolutely refuse to eat most of the foods on it, my kid-friendly recipes may not help much, and all I can suggest is that you try to veganize dishes that they already like. So I often forget how super-picky kids can be. Well, thanks to my nephew, consider me reminded! If I’d posted this family-favorite last week, I would have been selling it hard as a kid-friendly recipe; after all, it’s a dish that my daughter asks for all the time. But it has beans in it and, in this version, it even has greens in it, so if your kids won’t touch either of those ingredients, I’m afraid you may be out of luck. 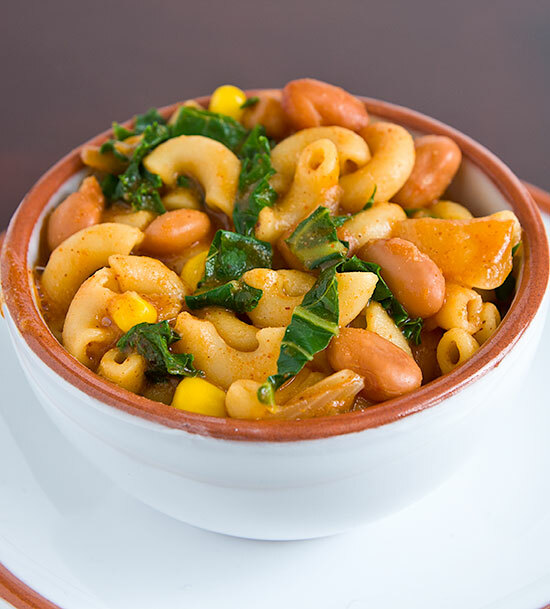 But if they’re open to eating beans, I think they’ll enjoy this vegan version of the childhood favorite, Chili Macaroni. Feel free to leave out the kale until you get your family addicted to it and then slowly add in the greens a little at a time. 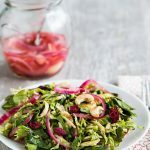 You’ll find that the kale provides nutrition and color but relatively little taste, so your more open-minded family members won’t mind it at all. Cook the pasta in plenty of boiling water until tender. Drain. Sauté onion in a large non-stick pot until translucent. Add remaining ingredients, as well as cooked pasta. Simmer for 15 minutes, stirring occasionally. Serve hot. If you’re ever in Pensacola, Florida, please check out the End of the Line Cafe. It’s a small coffee house near the railroad tracks, but we were all impressed by the delicious sandwiches, hummus, quinoa tabouli, homemade vegan cheeses, and incredible potato chowder. Saw this one through facebook the other day and realized it was on my list of recipes to try. Thanks for the reminder :). It came out great!! I subbed collards for the kale and added a ton of cayenne. My husband and I both enjoyed it. I love this recipe! 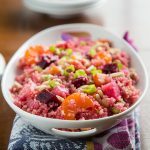 It is one of my go-to recipes and it makes great leftovers! Thanks for all your wonderful recipes! 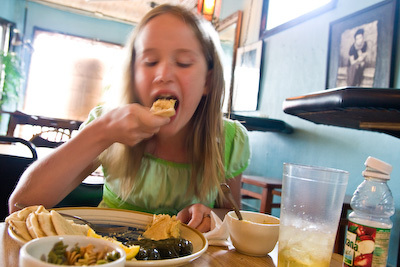 I live in Pensacola and End of The Line is my favorite vegan spot….really glad you mentioned them! Great recipe! Very filling, but I think it serves more like 3 or 4, rather than six if it’s a dish by itself with not much else. I left out the corn because I didn’t feel like opening a can of corn and only using half of it. Hi Susan. Thanks for this great recipe. What kind of chili powder do you use? I only used 1 tsp and it was still VERY spicy and you specifically mentioned that it is a mild dish. Since mine was not, the only thing I can think of is that I’m using the wrong chili powder. It says chili powder on the label, not chili pepper. Any suggestions? I have tried several of your recipes and loved them all. Thanks so much for sharing these great dishes. Right now I’m using the regular (mild) chili powder from The Spice House (http://www.thespicehouse.com/spices/mild-medium-or-hot-chili-powder#content), but I’ve used regular grocery store chili powder in the past with good (mild) results. 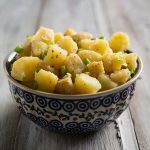 The main thing is that the second ingredient should be cumin and it should include garlic and other spices. While it could be a difference in chili powders, people’s tastes are different, and what is mild to me could be spicy to you. If that’s the case, I’m sorry that I lead you astray, and I hope you could actually eat the dish. Ah, problem solved. Mine has no cumin and cayenne pepper is the third ingredient! I like spicy food, so I ate it. I feel sure my powder is the problem. I’ll try this one. Thanks so much. On your link is what they call “regular” the mild flavor? Yes, their “regular” is actually the mildest. It does sound like your chili powder is much hotter! 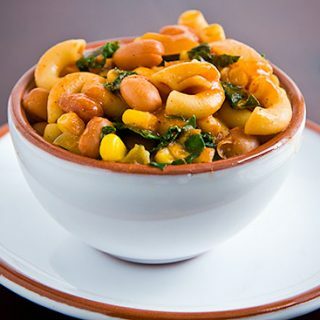 I’ve made this for my 3 grandsons (all picky eaters) and I have to say this IS one of their favorite vegan dishes I make for them. 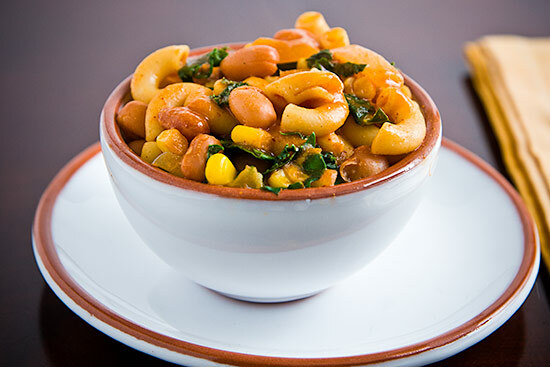 Even though beans & greens are not their favorite, I never get complaints about this dish–I think because the flavoring is so good & there is plenty of pasta. The adults all love it too, so it is a recipe we use repeatedly. I’m searching for a vegan entree to bring to a high school potluck. Does this require a bowl (consistency-wise) or is it pretty thick? There won’t be bowls available and if it’s “soupy” I don’t want it flowing into other foods on plates and being a turnoff in that regard. It looks yummy and of course I want the kids (and parents) to enjoy it! Thanks, I sure have loved your site for years! Thanks for the kind words! This is definitely plate food (I just photographed it in a bowl because it looked better). I hope the people at your potluck enjoy it! Score! I’m so happy to hear this! I will search no further and will be serving it up tomorrow night! Thanks again!! I work in a restaurant as a waitress, and it always drives me crazy when parents order their children’s fried rice or sesame chicken (which is an entirely fried dish except for the steamed rice and broccoli) without veggies! How can you let your kid not eat their vegetables?! If I ever have kids, they will eat their beans and vegetables, or they will go hungry. That’s the way I was raised (except I also had to drink my milk or sit in time-out, and now that I know more about milk, I question their judgment on that one) and if I have children, that’s how I plan to raise them. If they don’t like the particular dish, that’s fine, but NO vegetables? Unacceptable. This looks delicious! Is there anything you might suggest substituting the tomato sauce for? My vegetarian 2 year old son, unfortunately because he LOVES it, cannot eat tomato sauce because it causes ferocious diaper rash. He does really like pasta and beans and everything else in this dish. He also does eat dairy. Thank you! Do you think I could can this ? I don’t have any experience with canning, so I can’t say. I know that there are dangers when canning something that isn’t acidic, so I would be very cautious about it. This is SO good. I mean, amazingly good. A word of warning, though: this makes a *ton* of food. I would use the biggest pot you can find, because I really didn’t use a big enough one and it was really hard to stir it. I live in a small town area, and nutritional yeast is hard to come by. I was able to stock up last time I was in a bigger town, but do you know I could use instead? 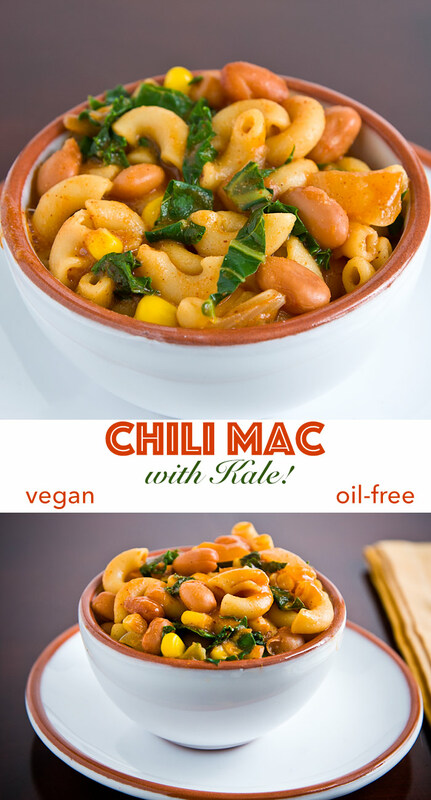 I tried this today because I needed to use up some beans and kale that it is so delicious, filling, and easy. Thank you! I’d really like to try this, but I’m concerned about the sodium content. Where does all the sodium come from? Nutritional yeast and chili powder are pretty low sodium, and low sodium beans can be used. Tomato sauce with no added salt is also available. Is there some other reason the sodium content is so high in this recipe? No, you covered it. If you use salt-free beans and tomato sauce, you’ll reduce the sodium considerably.